Chippenham serviceman L/Cpl Stephen Crofts became one of the first casualties of the Gulf War when he died on Sunday (10th) from injuries he suffered in the Middle East. 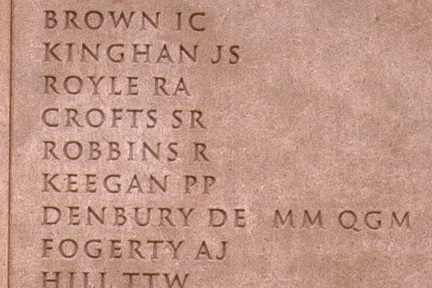 This week his parents, Derek and Diane, who live in Parliament Street were too distraught to talk about their 23 year old son who was in the Royal Corps of Transport. The Ministry of Defence would not release any details about the incident which led to L/Cpl Crofts suffering severe burns, although there is to be an investigation into his death. All the MoD would say was that L/Cpl Crofts was evacuated from the Gulf after a non-operational accident in Saudi Arabia. He was the first Gulf casualty to be airlifted by helicopter to Frenchay Hospital, Bristol since it went on war alert. He died there at 1145 on February 10th. L/Cpl Crofts was a former pupil of Sheldon Scholl and head teacher, Mrs Caroline Cox, said that staff were deeply saddened to hear of his death and remembered him as a cheerful lad. Mr Donald Dry collapsed as people were arriving at Sheldon Road Methodist Church for the military funeral of the 23 year old L/Cpl. Chief Inspector Brian Collins and a soldier at the funeral tried to revive Mr Dry in a hall behind the church but he was pronounced dead by a doctor and taken away by ambulance. Mr Dry who was single was 62 and lived only a few doors away from the soldier’s parents, Derek and Diane, in Parliament Street. The couple were joined by Stephen’s elder sister, Stella who had flown in from Canada for the funeral and his fiancée Fraulien Marian Mader who met her husband to be in Germany where his unit was based. Soldiers from the Junior Leaders Regiment at Colerne formed an honour guard outside the church and acted as pall bearers. He was serving with the Royal Corps of Transport in the Gulf and colleagues were at the church to pay their last respects. 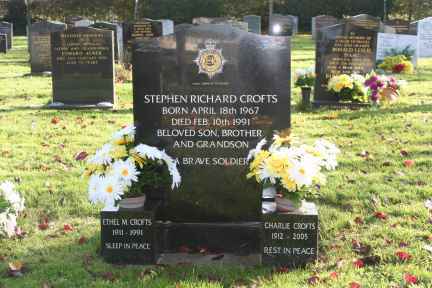 Cpl Crofts died in Frenchay Hospital, Bristol on February 10th from 30% burns and from inhalation burns to his lungs. He was evacuated from the Gulf after being involved in an accident in Saudi Arabia. The MoD refused to release details of the incident until after the war but has confirmed that it was not the result of enemy action. After the service, the coffin which was draped in the Union Jack was taken to the London Road cemetery for burial.